"APPA Mundi Tasks is an advanced Task manager application which synchronizes with your Exchange Server mailbox to make your task list available on the move." As the poll I published earlier this week shows, there's a large majority of users who need Tasks support on Windows Phone 7 - it just so happens that the developer of APPA Mundi Tasks posted in that thread letting us know about his product, so here I am sharing it with all of you. It even syncs with Exchange! If you've been looking for a Tasks solution, try this out and let me know how it works. I've been using this since it came out, it has already had several improvements and works very well for me. 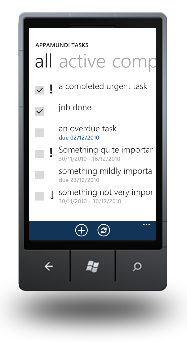 I was disappointed that tasks were not included in windows phone but since I have had this app I have it covered!